In pictures — Over 800 students from 34 high schools throughout the country participated at the Byblos-campus event. 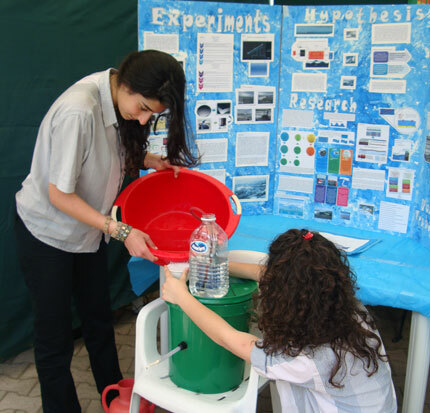 Over 800 high schoolers from 34 schools in Lebanon participated in various competitions during the 12th annual Science and Arts Fair, held at LAU Byblos from May 6-7. The event included a science-knowledge competition, exhibition of science projects, solar-powered remote-controlled car races, as well as solar-powered vehicle design, testing and display. Students more interested in arts showcased their skills in photography, painting, sculpture, graphic design, dance, theater and filmmaking. Others took part in the writing competition (held in late March), presenting short stories, essays and poems in Arabic, French and English. The prizes were announced on May 7. 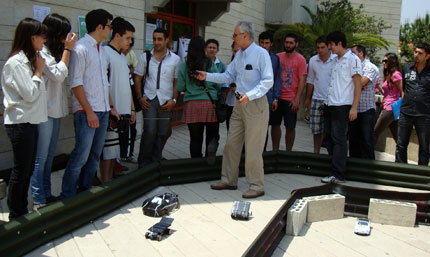 Dr. Mars Semaan, Dean of Students in Byblos, oversees a solar-powered car race, held as part of the event. The students presented a wide range of creative science project ideas. Here, one of the teams displays an electronically controlled crane. Students Marwa Traboulsi and Lara Feghaly from Eastwood College in Mansourieh demonstrate how electricity can be generated using a pump, floats, and weights. “Lebanon can develop tremendously with a device like this,” Traboulsi said. 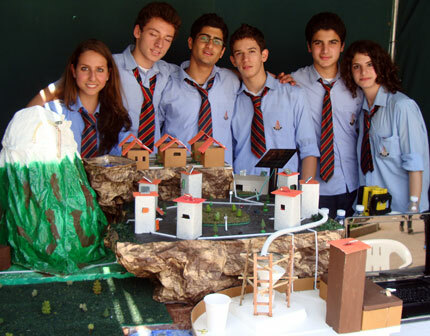 A team of students from Sagesse High School in Ain Saade built a “perfect city” which uses solar and wind technologies to create energy, and has a biofuel crop to power its hybrid cars. Students from Saint Joseph School in Cornet Chehwan explain the cloning process. 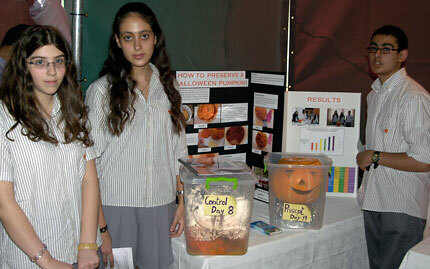 Students develop a formula to prevent pumpkins from decomposing over long periods of time. 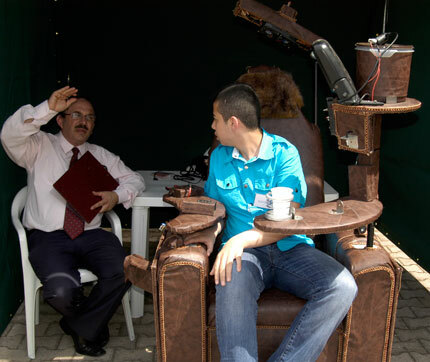 A team of students built an all-purpose comfort chair retrofitted with all kinds of gadgets. 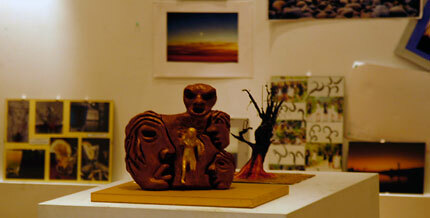 Dozens of photographs, paintings and sculptures made by the students decorated the Rima Hourani Exhibition Room. A series of dance and theater performances were held in the Selina Korban Theater on May 7. 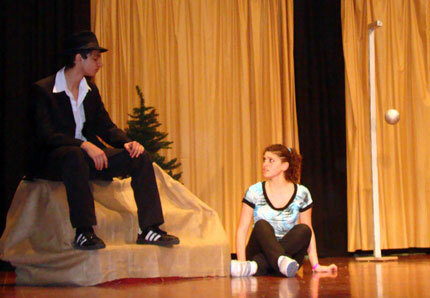 Here, students from Tripoli’s Evangelical School perform a play. There were also dance performances from Jesus and Mary School, Lycee Amchit, Montana International College, and the National Orthodox School in Akkar. 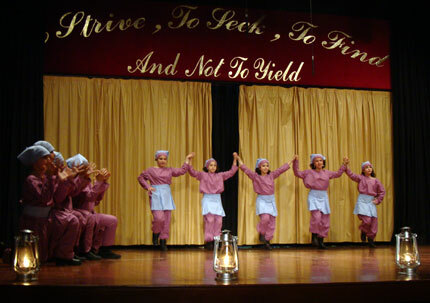 Students from the National Orthodox School in Akkar sing and dance. Following the performances, Dr. Semaan announced the winners of the “School of the Year” competition. Saint Joseph School won the Arts Award, and Notre Dame Jamhour won the Science Award. “In my opinion, every school was the school of the year,” Semaan said. The principals from the winning schools will each choose one student to study at LAU at half cost.